Content upgrades are far from a new idea, but they are one of the most effective ways to encourage your readers and followers to sign up for your email list. Your email list has one job- to deepen the relationship with your subscribers based on trust and giving. Furthering this relationship not only helps your readers achieve their own goals, it also leads them naturally to working with you. Whether that is buying your products or hiring you for your services, people who know and like you will be much more willing to work with you than someone who has just come across your work for the first time. To start the relationship however, you need to get people on your list to begin with. And fortunately, this really isn't as complicated as it might seem. You offer a small, helpful, exactly-what-they-need-right-now product or service for free in exchange for that reader's email address. Ideally, you should have at least eight opt in offers floating around on your site in some key areas. It's also a good idea to have a few off of your site, which we will talk about below. Here's a content upgrade idea I just love. Videofruit's brilliant head honcho Bryan Harris created Smart Bribe, an easy plugin that adds a click to tweet feature to any content upgrade you create. This means that if someone is interested in opening or downloading the content upgrade you are offering them, they must first click a button and tweet about the content upgrade to open it. You can even pre-fill the information in the tweet with the URL of your blog post or landing page. ​Pinterest is an absolute gold mine for finding new readers for your blog or website. 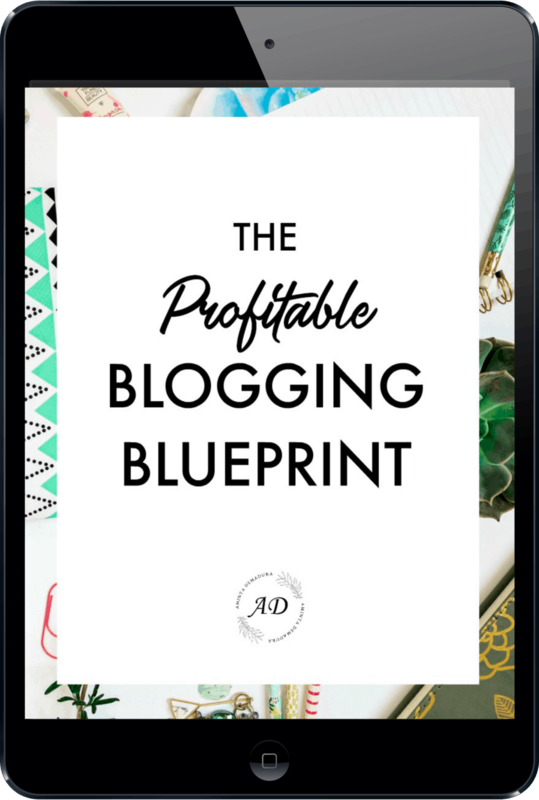 I get at least 80% of my traffic from Pinterest, and tons of other bloggers do too. That's why it's a great idea to create pins specifically for each of your content upgrades, and share them in group boards and Tailwind Tribes that you are a part of. If your pins are easily readable, bright and attractive looking, it won't be difficult to get plenty of traffic when you share them through group boards and Tribes. I highly recommend creating at least three different versions for each content upgrade to see which one performs best, and then tailor future pins as needed. A quick note about linking to your content upgrade- Pinterest doesn't like it when pins lead straight to a landing page, so I highly recommend creating a blog post or page on your site for each content upgrade instead. You can insert an opt-in form on this page to allow people to opt-in, while staying on Pinterest's good side. ​One of the easiest and quickest ways to get new people onto your email list is to add a link to your header navigation. 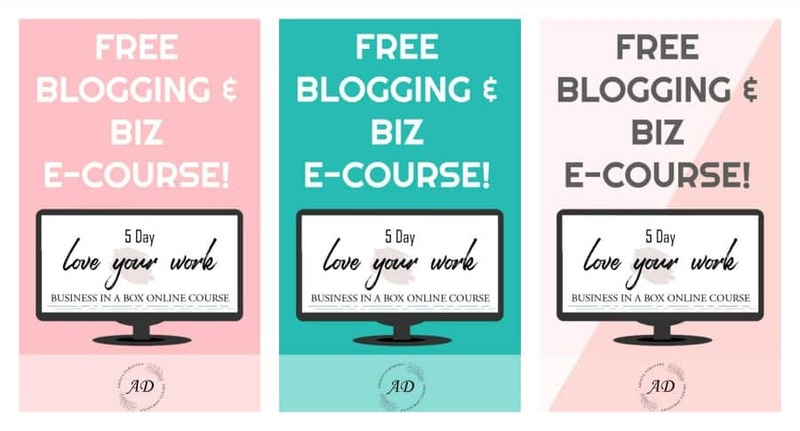 Mine reads "Free Course " and leads readers to a page where they can opt in in order to receive my popular business-building e-course. Another way I've seen this done is using a Start Here link in the header navigation to lead to a content opt-in. Upside down home pages are all the rage right now, and for good reason. This style of homepage puts you and your offering front and center for anyone who visits your website. It's a great way for them to get an instant glimpse into who you are, what you do, and how you can help them achieve their goals. 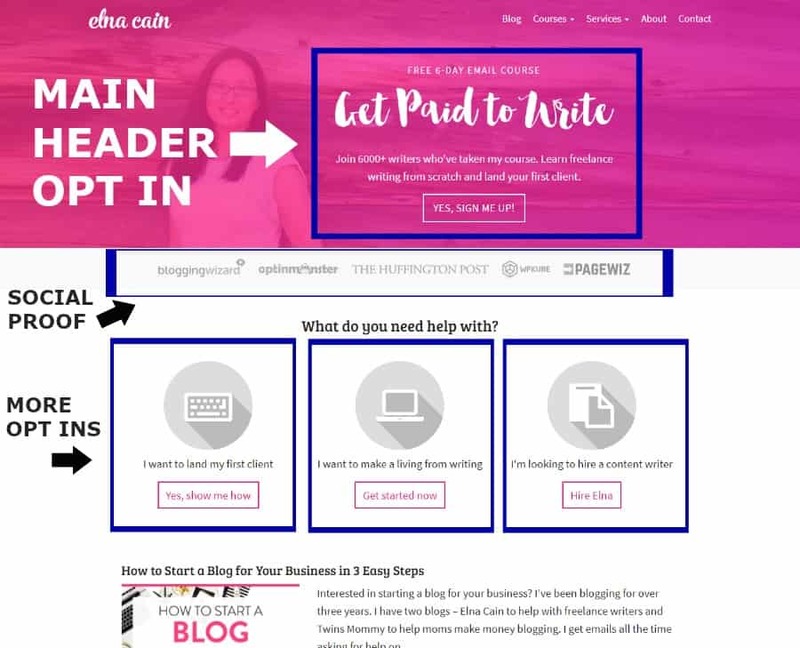 Elna Cain's main homepage is an excellent example of a header opt in, followed by social proof, and then three options with accompanying opt ins to help direct her readers towards the most useful content upgrade for them. ​Here's a great way to repurpose your content upgrades. Simply create a password protected page where you upload all of the single content upgrades you have created. This works best if you have a handful of them instead of just one or two. Then create a nice looking opt-in to add to the bottom of every blog post that gives people the password to the page in exchange for their email address. 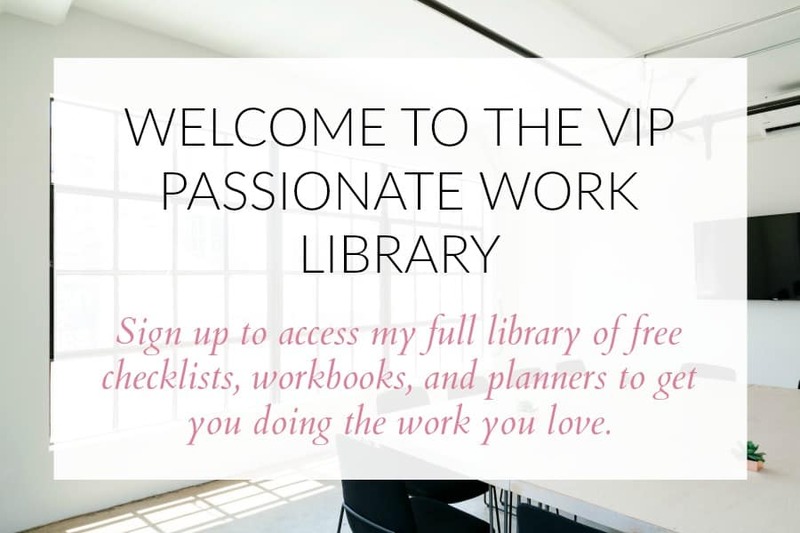 If your stuff is high-quality, it'll be hard to say no to signing up for a library full of useful worksheets, workbooks, and checklists. ​Do you regularly do video or record podcasts? If you do, putting a link to a relevant content upgrade in the show notes and referencing it in the video or podcast is a great way to help your readers even more and encourage them to sign up for your list. The key here is to make sure that the content upgrade you are offering is specific to what you are talking about in your video or podcast. Ideally, it should help them immediately take action on what they have learned. ​While placing quality content upgrades on your site is crucial to building your email list, it's also a great idea to have a few that are off site. One way to do this is to publish a book or manifesto on Amazon and include a super relevant and truly helpful content upgrade on the first and last pages of your book. Since Kindle books are digital, you can simply design a nice opt-in page for the beginning and end with a link back to your landing page. ​Guest posting is still an important part of spreading your message and gaining new audience members. The key here is to make sure that you include a very actionable and relevant content upgrade to each of the guest posts that you write. 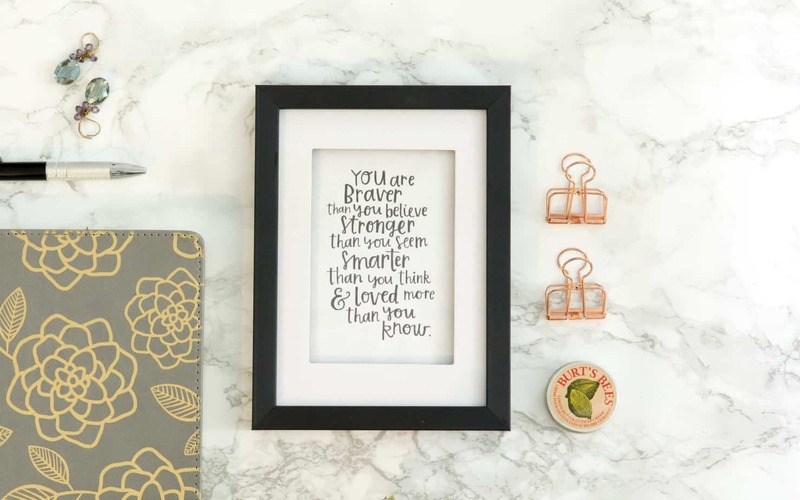 This will help encourage readers from that particular blog to jump over to your site and learn more about you and what you have to offer. ​Asking for a testimonial not only gives you great social credibility to use on your blog, it also incentivizes people to check out what you have to offer. The underlying feeling is that if the product needs a testimonial then it must be something valuable. And of course, your content needs to be incredible or your business simply won't thrive. Make sure you check the rules of the Facebook group first, as many don't allow any sort of self promotion. Got your self a slot in another bloggers podcast? Great! The next step is to create a content upgrade specific to the conversation you and your host will be having. Make sure you ask your host about mentioning the upgrade in advance. If they give their permission, you can work the freebie into the conversation naturally so that listening guests know where to get more help and insight after the show. The key here is to make it super easy for your audience to remember where to find your freebie. Since the show will be in audio, you don't want to try to read them off a URL that is longer than a string of crawdads on a hotdog. Make it something short like mysite.com/ecourse and tailor it to your site. Another great way to gain subscribers is to create a closed Facebook group that is only for members who apply to join. You can find new members by posting on your social media accounts, hosting giveaways, and emailing your current email subscribers to join and invite their friends who might be interested in what you teach. Once you set up the Facebook page, be sure to pin your content upgrade to the top of the page so it is always visible above other posts. You can also nicely request that new members join your mailing list and follow you on other social media accounts in order to gain access to your closed group. 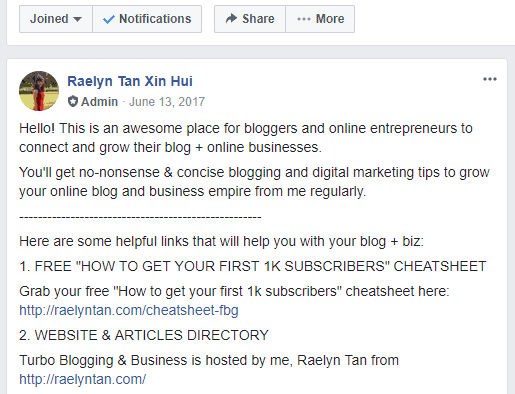 Raelyn Tan does a great job of directing new members of her group to her free cheatsheet upgrade, followed by her website and the group's rules. Let me tell you, Pinterest users love group boards and there's a great reason why. Group boards are one of the bets ways to get new eyes on your pins and ultimately on your blog posts as well. However, it can sometimes be difficult to get into group boards because there are so many people who want to join and typically not enough boards to go around. ​This one is pretty simple. Place a well-designed sign up form in the middle of your blog post with an image of the content upgrade you are offering. This can certainly be the same content upgrade that you offer in your header navigation, or your resource library, or anywhere else. The important thing is to make sure that it is relevant and useful to the people who are reading that particular post. 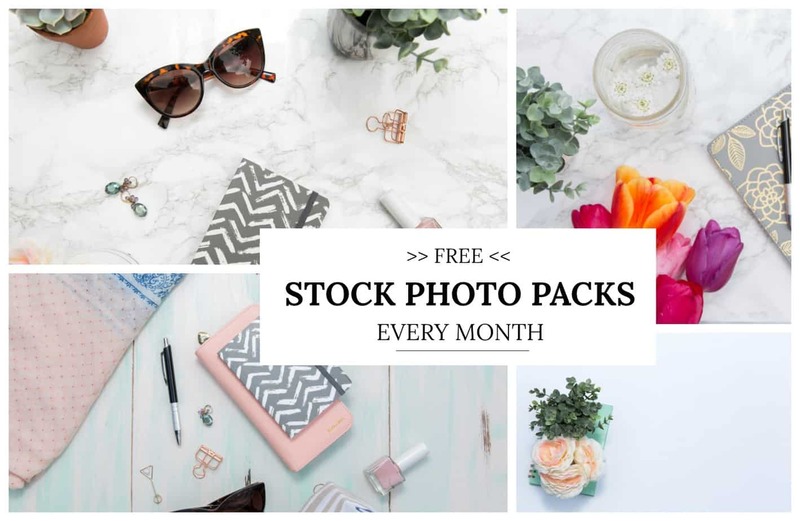 ​If you have a social media following on any of the social media platforms, now would be a good time to offer your freebie to your followers. If you have an ebook or e-course you plan on giving away, you can try to build some excitement by including testimonials from a few other people who have taking the course or read your book. This will encourage other followers to also sign up. ​SlideShare has become a really popular place for people to check out informational presentations. If you turn some of your most popular blog posts into PowerPoint slides, you can upload them to SlideShare with a content upgrade and call to action at the end of the slides for people to get more information. If your content is super helpful and fills a need that people have, getting new sign-ups should be a cinch. ​Each of these does take a little bit of time to set up and certainly some more time and effort to create a content upgrade that is worth its salt. While you may be worrying about the time involved to create extra content beyond your blog and set up all of these systems, know that it is so worth it. From a business standpoint, one of the biggest parts of making your business successful is getting people onto your email list so that you can build a relationship with them. Without an email list, selling to cold prospects is very difficult. So I hope you'll take the time to put at least a few of these suggestions in place. You certainly don't have to do all of them to be successful.